Doctoral student Amanda Murby monitors a lake aerosol collection system developed by UNH researchers on Lake Christine in Stark. Aerosolized cyanobacteria cells and toxins are collected on a fine glass fiber filter. 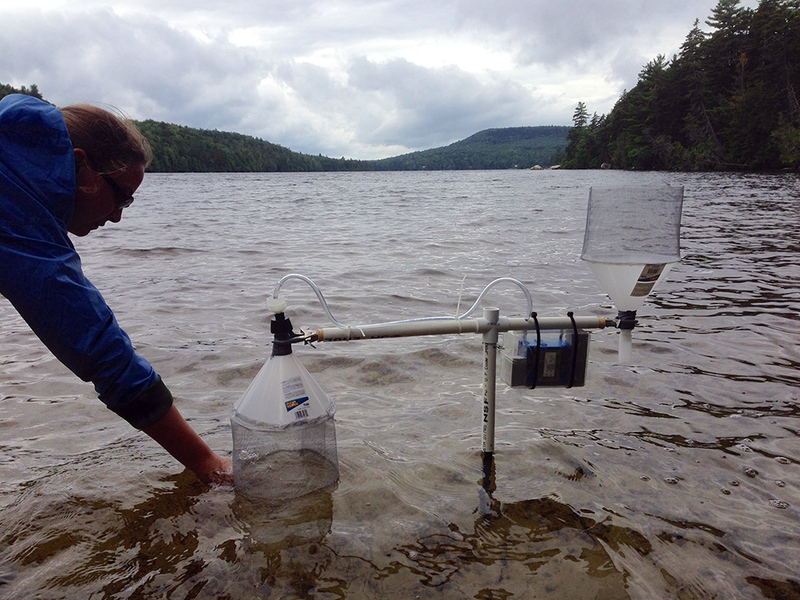 Researchers with the NH Agricultural Experiment Station at the University of New Hampshire have invented a low-cost method to monitor lakes for dangerous airborne toxins that have been linked to liver problems. Jim Haney, professor of biological sciences who directs the UNH Center for Freshwater Biology, and Amanda Murby, a doctoral student, have developed a highly portable system for collecting lake aerosols produced by cyanobacteria, or blue-green algae blooms. Cyanobacteria occur in freshwater lakes across New Hampshire and elsewhere. These harmful blooms produce toxins called microcystins. Exposure to large amounts of these microcystins can cause liver damage. Exposure to smaller amounts can cause breathing problems, skin irritation, upset stomach, and other gastrointestinal problems. 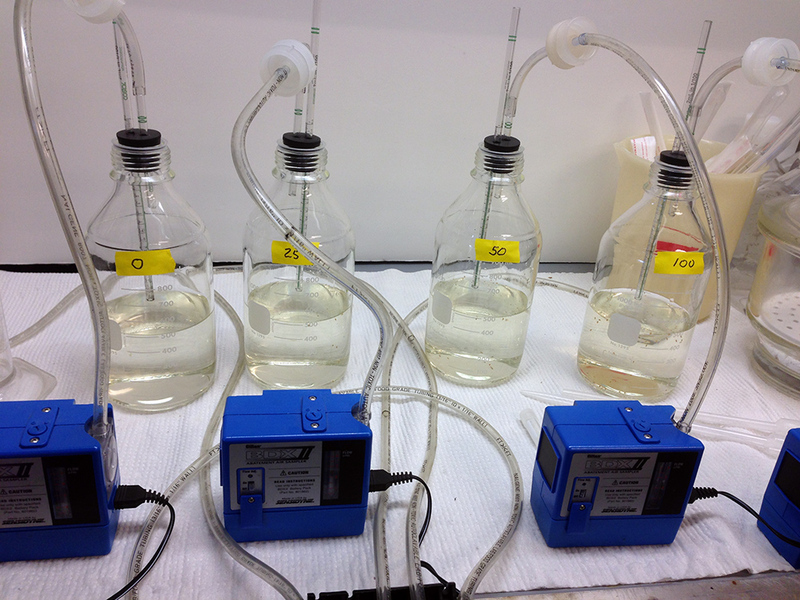 The researchers, who also have developed a system that can be used in the laboratory to measure aerosols from freshly collected water samples, detail their new detection method in the article “Field and Laboratory Methods to Monitor Lake Aerosols for Cyanobacteria and Microcystins” in the journal Aerobiologia. “Few studies have examined risks to wildlife and humans from exposure to airborne cyanotoxins. However, recent research has indicated that cells may be transported as aerosols from lakes with high concentrations of cyanobacteria and microcystins. Since aerosols may be a more direct route of exposure to public health for those recreating or living by a contaminated body of water, we set out to design a method that could address the aerosolization of cyanobacteria released from lake water,” the researchers said. “Our preliminary research results raise concerns over the potential exposure of humans and wildlife to aerosolized cells of cyanobacteria and their toxins. The methods we have developed could be useful for monitoring air in proximity to bodies of water for toxic cyanobacteria for public health purposes,” they said. The aerosol research is particularly important given that Haney’s research team has found that aerosols are a mechanism to disperse cyanotoxins directly to crops and humans that reside near lakes with harmful cyanobacteria blooms. “We have determined that microcystins may be transferred to crops. We detected microcystins in lettuce that was irrigated with water from a lake that frequently experiences blooms of cyanobacteria. Similarly, we found moderate to high levels of microcystins in blueberries grown near a lake with persistent cyanobacteria. Soil samples taken at varying distances from the shore of a cyanobacteria-dominated lake tested positive for microcystins as well as for living cyanobacteria,” Haney said. 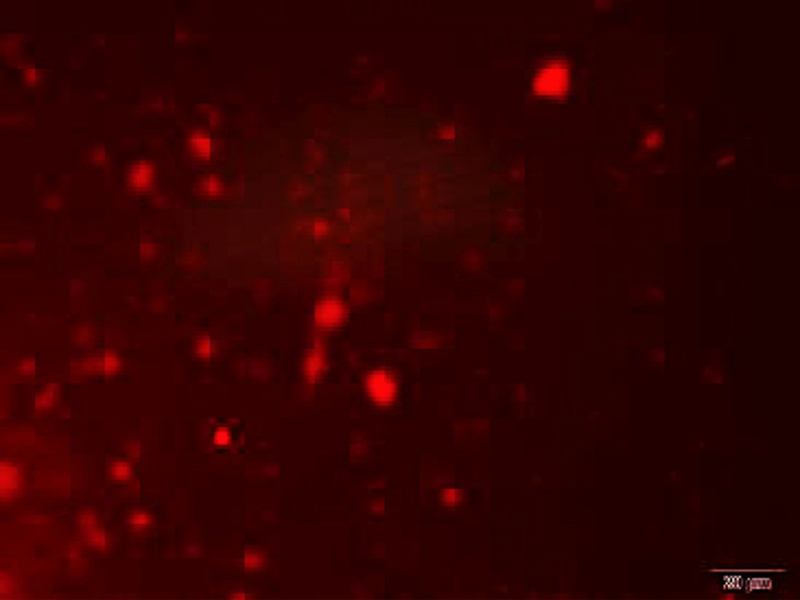 The research is part of an extensive, multi-year research project led by Haney that also is examining whether the transfer of microcystins within lakes may result in biomagnification at higher levels in the lake food chain, such as in fish, thereby representing a potential source of toxins for humans and animals. UNH researchers have tested cyanobacterial blooms on several New Hampshire lakes, including Lake Attitash, Baboosic Lake, Goose Pond, Lake Kanasatka, Naticook Lake, Nippo Lake, and Willand Pond. “Cyanobacteria blooms are unpredictable, and it is important that lake users be able to identify them. Blooms usually are green in color and sometimes referred to as green scum. Often lake advisories are posted to warn users of the presence of a potential toxic cyanobacteria bloom,” Haney said. “Reported incidences of harmful cyanobacteria blooms in freshwaters have increased worldwide. There are frequent reports of deaths of domestic animals such as dogs and cattle caused by drinking water contaminated with high levels of toxic cyanobacteria,” Haney said. Since cyanobacteria thrive under warm conditions, it is expected that global climate change will further exacerbate the problems of toxic cyanobacteria blooms. To learn more about cyanobacteria blooms, visit the UNH Center for Freshwater Biology at http://cfb.unh.edu/. A short video about cyanobacteria in New Hampshire lakes is available at http://cfb.unh.edu/Movies/Cyanobacteria_Murby_web.mov. This material is based upon work supported by the NH Agricultural Experiment Station, through joint funding of the National Institute of Food and Agriculture, U.S. Department of Agriculture, under award number 1007227, and the state of New Hampshire. Are Toxins Escaping our Lakes?